There are several variations of home made slot mortising tables on the web. Most have separate handles for sliding in each direction. I had a set up like that as well but wanted a single joystick for two directions. My solution was to use tie rod ends. The shaft you see is a 3/8” x 8” bolt and I ground a groove to accept a c-clip to hold it in place. 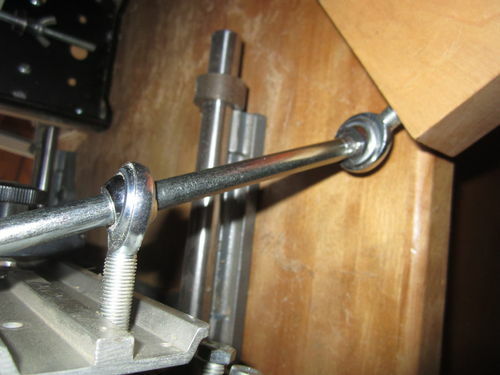 The lower tie rod end is threaded into a scrap and currently held in place with clamps. Not shown is a wooden dowel handle that threads onto the bolt. Works great and cost nearly nothing so I thought I’d pass it along.